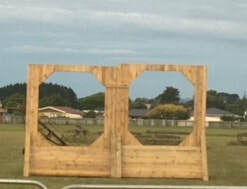 Waitara Pony Club is located in the northern Taranaki town of Waitara. We are lucky to have a dedicated group of instructors and volunteers, together with a strong team of enthusiastic members, that make our club a success from year to year. We cater to riders of all levels of riding ability and provide excellent training opportunities to our members through training squads and extra coaching lessons. If you are considering joining pony club and would like more information about the Waitara Pony Club, please visit our About Us page or contact our president, Bernie Trott for more information. 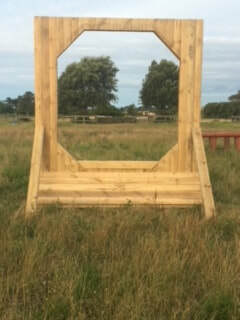 Our new jumps have arrived! Linda Huitson - Dressage Judge, Jo Reweti - Dressage Writer, Julia Bolton - Show Jumping Judge, Neisha Steiller - Show Jumping Writer and Cath Spindler for helping with Scoring. 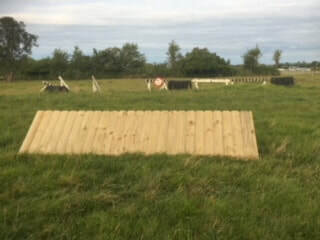 Thanks to Bob Harlan for running a BBQ and drinks stand and all the parents who helped flag the course and man the jumps in the heat. Glad we got to share this day with NPPC. ​LETS GO! ORIENTATION DAY : become a member of Waitara Pony Club. Saturday, 11th August @ 10am - 12pm @ our fantastic grounds & club rooms on Cracroft Street, Waitara. Your pony is not required, as orientation day is unmounted. However if you would like to go for a ride on the arena, you are more than welcome. There will be a BBQ to welcome new members to the club. to register for pony club this season. There will be no paper registrations. Do not push pay now when you register, you will get an email with payment details once you push submit only. For members with more than one rider in the family push add another subscription and when all family members entered, push submit only. A rally schedule will be available in due course Any questions, please ask! Thanks to our coaches for making this possible! new helmet regulations come into force. at any time you MUST have a new regulation helmet. NO exceptions. This is a new initiative from NZPCA aimed at Junior riders. There are badges for all major milestones of being a junior riding member such as “first pony club camp”, “first competition”, “hunting” as well as two levels of badges covering HM topics such as grooming, feeding, health and saddlery (there are quite a few more topics but I only have so much space!) Rebecca as the head coach is the administrator for the badges and will be in charge of keeping track of riders meeting the requirements and the issuing of badges to successful riders. Some badges require riders (or parents) to complete an application form confirming they are eligible for the badge. Achievements can be back dated to 1 January 2014. Check out the information on the NZPCA website (under the “rider tab”). Is a new NZPCA initiative, this one aimed at riders 13 and over. There are three levels of achievement Bronze (approx. C certificate level), Silver (C+) and Gold (B). Riders can enter the programme at the level most appropriate to them. Riders select different electives from the list provided which must be a mix of ridden, pony club service, horse mastership and creative/arts. Riders must meet the requirements of each selected elective in order to achieve the certificate – NZPCA must think our head coach doesn’t get up to much in her spare time as you guessed it, Rebecca is the administrator for the equine skills programme as well. There is information on the NZPCA webpage (under the riders tab).